It used to be that there were only a few different kinds of wires that people needed to run throughout their homes to ensure that they could use their various electronics and connectivity devices. As long as the electricity, cable and phone wiring was run properly, they wouldn’t run into any major issues. But in today’s digital world, there is so much more that many of us want available in our homes. That also means that there are so many different cables and wires to manage different devices and connections, it can be difficult and confusing to keep up with it all. From wiring for surveillance and security systems to running cables for internet connectivity and home audio to connecting to other home automation functions, wiring a home can be an overwhelming and even a seemingly impossible task for the average homeowner. NYCONN Security Systems can help solve wiring problems for homeowners by running structured wiring throughout homes that will keep audio, video, telephone and data signals connected at all times. We will take your various RG-6 and RG-59 video cables; CAT-5, CAT-6 or fiber optic network wiring; audio cables and any other connections that you have and make sure they are bundled and neatly run to locations throughout the home where you need them most. 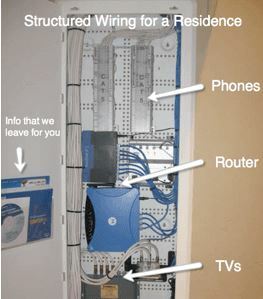 This will allow you to access your wiring whenever you need it, and it will make it easy to hook up computers, surveillance cameras, home theater equipment, whole-house audio and more. If you were to try and bundle your wiring on your own, it may take you weeks and there’s a good chance that you would run into problems meeting the shielding requirements or getting cabling through floors and walls. But with a call to NYCONN Security Systems, we’ll get to work making sure your whole home is wired in no time, allowing you to enjoy the benefits of structured wiring right away. Whether you have lived in your home for ages and just want to bring it up to speed in the 21st century or you are moving into a new home that doesn’t have all the wiring and functionality you’re looking for, NYCONN Security Systems can install structured wiring throughout your home. Call us at 800-783-5004 today and find out how we can help you with all of your wiring and connectivity needs.